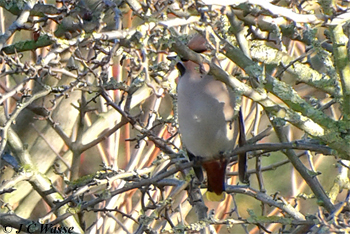 Several weekends birding Rainham in January and February produced the typical winter returns. At least 2 Marsh Harriers hunted the Silts whilst Common Buzzards looked on and a lone female Peregrine a top a pylon looked huge even at distance as it surveyed Wennington Marsh. Not forgetting the ever present Kestrels and big female Sparrowhawk that buzzed the area on several visits. 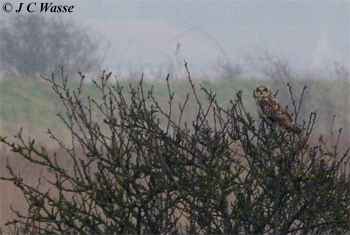 A couple of Short-eared Owls patrolled Aveley Bay/MDZ on two visits. A Water Pipit was often seen feeding along the pool edges at the Shooting Butts hide whereas the wintering Rock Pipits on the foreshore seemed to be scarce this winter. Wintering wildfowl were evident especially as the reserve took on seasonal water and included a good variety of dabbling ducks, with double figures of Pintail. 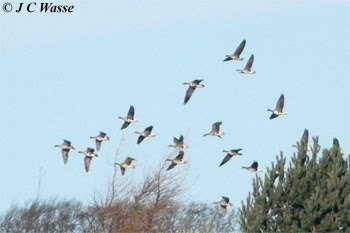 5 (Russian) White-fronted Geese flew onto the reserve to roost (11 Feb) flanked by Greylag Geese. A group ranging from a dozen to thirty Avocets took a liking to Aveley Bay throughout., with Lapwing plentiful on both sides of the Thames but Golden Plover eluded me. A Grey Plover looked lonesome on the Thames shore with several Curlews, but Black-tailed Godwits roosted together on the reserve (150+ on 04 Feb). Lots of Stonechat around the reserve, Cetti's Warblers winding up their 'vocal chords' throughout, and a Waxwing entertained all in late January as it fed by the visitor centre. Gulls on the Thames included the regular '5'. 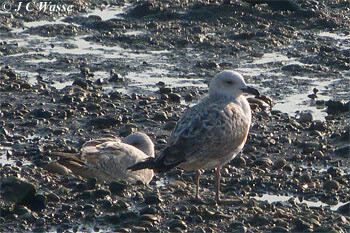 Also Yellow-legged Gulls seen at Rainham and up river at Thames Barrier Park (TBP). 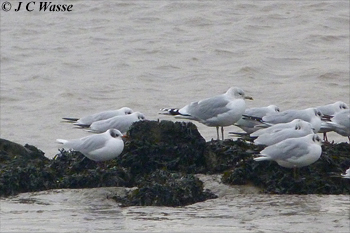 An adult Mediterranean Gull joined roosting gulls at Rainham's Coldharbour Point (14 Jan). One 1st winter Caspian Gull at TBP from three Sunday visits was a low return given the numbers of Caspos present in the area, but of attraction were the colour-ringed gulls. Lots of local (Rainham/Pitsea) Black-headed Gulls (yellow rings) and Herring Gulls (orange/red rings) with a couple of Danish (white VH37) and GBB Gulls (black JWR26) noted. Scandinavian argentatus Herring Gulls are usually ten a penny back home in winter, but the Thames shore is and was dominated by argenteus examples. 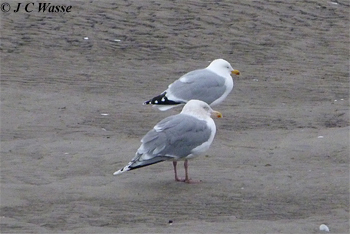 The brute of a 'Scandi' Herring Gull shown below dwarfed some of its British cousins. 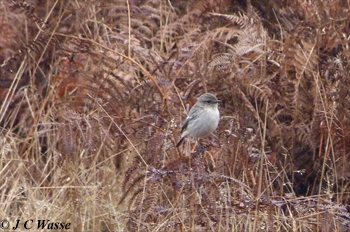 Elsewhere connected with the pale/grey Stonechat early in the year at Richmond Park and a visit back home saw me and my dad twitch the Pine Bunting near York. A cracking Yorkshire tick, we were lucky to relocate it early in the afternoon (28 Jan) when wandering round the muddy field edges (after spending 3 hours in the rain staring at a hedgerow!) A group of 31 (Russian) White-fronted Geese was a fine sight at Ingbirchworth Res., South Yorkshire (29 Jan) even so as they 'yapped' in flight, not at all familiar with their call. A bit of a goose fest going on there as a flock of 8 Pink-footed Geese stopped off to join the White-fronts, Greylag (160) and Canadas (275).